Indian swimmer, biker and athlete. Deepa Malik was born on 30 September 1970. She is an Indian athlete. She is the first Indian woman to win a medal in Paralympic Games and won a Silver medal at the 2016 Summer Paralympics in the shot put. 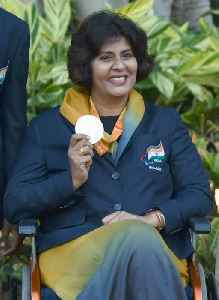 She has also won gold in F-53/54 Javelin event at the para athletic grand Prix held in Dubai in 2018. She currently is the world number one in the F-53 category. Shes won accolades for her participation in various adventure sports. She is associated with Himalayan Motorsports Association (H.M.A.) and Federation of Motor Sports Clubs of India (F.M.S.C.I.). She has undertaken an 8-day, 1700-km drive in sub-zero temperatures which included a climb to 18000 feet. It was – Raid De Himalaya. This journey covers many difficult paths including remote Himalayas, Leh, Shimla and Jammu.